Human children learn through play. An overwhelming amount of research in the past 30 years has proven that outdoor play stimulates speech, cognition, gross motor skills, fine motor skills and social skills more efficiently than any other method of instruction. Modern playgrounds are designed to create opportunities for collaborative play and social interaction – but that’s hard to imagine if your local playground is crumbling before your eyes or is inaccessible to your child. The playground at my son’s school was literally decaying when an old friend asked me to help her write grant proposals for a new playground. By working with the playground team, I was introduced to the world of accessible and inclusive playgrounds. And now that the new playground has been built, I’ve seen firsthand how dramatically the right equipment can enhance children’s ability to learn and develop new skills. When planning a playground for children with special needs, it’s important to understand the difference between an accessible playground and an inclusive playground. Fortunately, there are several equipment companies that can explain these differences clearly and offer guidance in finding sources to fund the project. An inclusive playground fulfills requirements of the Americans with Disabilites Act (ADA), but not all components are required to be wheelchair accessible. Features will encourage group play and sensory integration, so that children at different stages of development can explore their abilities together. Here is a checklist for ADA compliance. A fully accessible playground has no physical barriers, plus all of the features of an inclusive playground. The playground’s surface material provides ease of movement for wheelchair users, and adaptive swings are typically available. Many playground features will be accessible at ground level, and ramps allow access at upper levels of the play structure. Most playground manufacturers have regional representatives who can help a community group with the entire process of designing, planning and constructing a special needs playground. Here are six manufacturers with innovative and accessible products. Landscape Structures was the company that contracted with my son’s school. We found that several of their playground components were created for specific needs, such as physical disabilities, autism or vision impairments. For example, the Sway Fun glider is the first wheelchair-accessible glider that also meets playground safety requirements. Game Time is the manufacturer that I see most often at city playgrounds, and it is one of the preferred vendors for non-profits such as Unlimited Play that build accessible playgrounds in local communities. Game Time’s EveryBODY Treehouse has accessible ramps leading to and through the structure so that children of all abilities can enjoy the experience. Play and Park is another preferred vendor for non-profits committed to constructing accessible playgrounds. 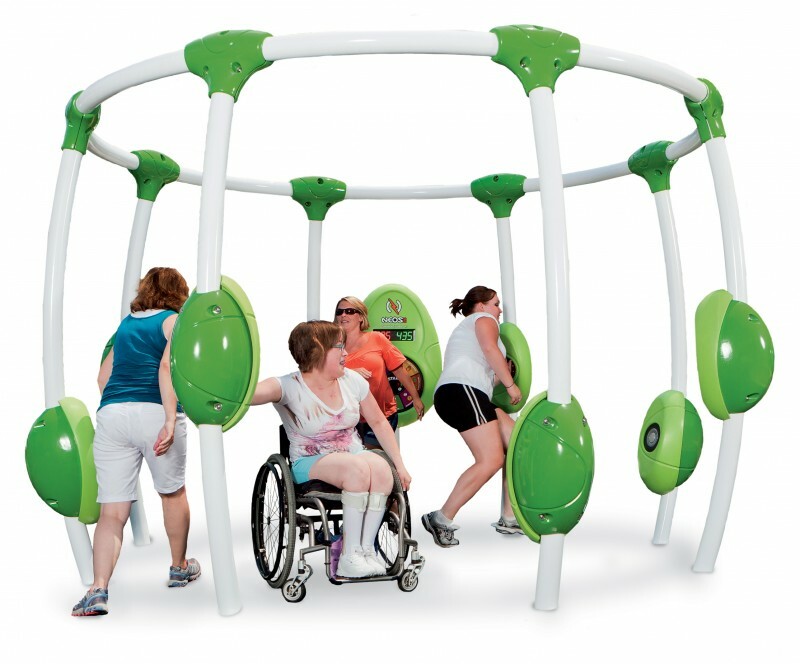 The play structures are accessible at the ground level and compliant with ADA requirements. An 8 foot accessible ramp can be added to any structure as an optional component. Designs by Playcraft Systems are accessible at the ground level and have some transfer points to make the upper level accessible. At the Playcraft structures that my family has visited, I noted that the structures are ideal for high energy children who love to explore and climb, especially the new Playcraft Revolution. 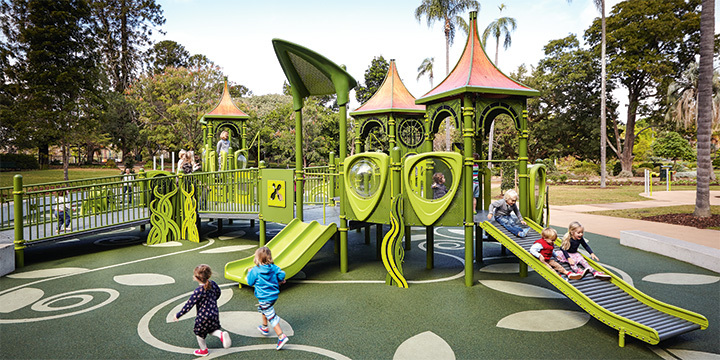 Playworld is known for its non-linear designs, which encourage new routes across the playground and creative problem-solving as children figure out different ways to reach a component. We were very excited when we saw a Playcraft structure installed at a local playground, and I saw that every visit was a completely new experience for my children. The components are fully accessible at ground level and offer transfer stations for wheelchair access to the upper level. 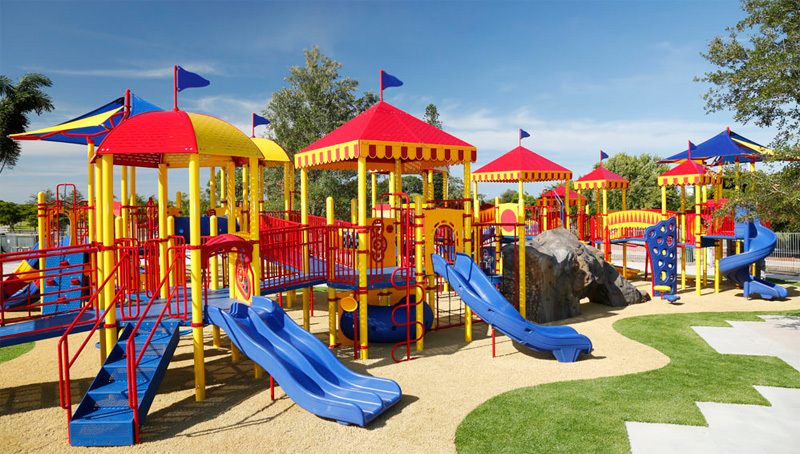 Leathers and Associates offers customized commercial and residential playgrounds. Many of the designs in their portfolio are theme-based, and several components such as swings, ramps, and musical instruments, are intended for children with mobility impairments. How Do I Get One In My Neighborhood? Fully accessible community playgrounds start at about $100,000 and may cost double or triple that amount, depending on the size of the project. Raising funds for a playground is a daunting task, but it is possible. At my son’s school, we made every connection we could possibly find through school fundraisers, grants, private donors and corporate sponsorships. At the last minute we even pulled together a garage sale to raise the final $2,000! Here are some resources to bring you one step closer to the playground of your dreams. An archived article in the magazine PTO Today nicely summarizes how to organize a playground fundraising effort. Landscape Structures offers a 40 page Playground Grant Guide that describes government, corporate and non-profit grant opportunities. Kaboom! is a non-profit that provides playground grants to economically disadvantaged communities. Based in Missouri, Unlimited Play is a non-profit that helps to plan, design and build fully accessible playgrounds. What have you done to make play accessible in your community?